Marketing Messages is a full service provider of professionally recorded voice messages. They offer narrations needed for interactive voice response (IVR), narrations for web videos, presentations, Music-On-Hold, Messages-On-Hold, and narration for e-learning applications in over 70 languages and dialects. Marketing Messages works with their voice artists on the scripting, editing, file naming/distribution/archiving, and post-sale support to provide a top quality and full-service experience. Marketing Messages came to 3 Media Web with an outdated website that did not reflect today’s design or messaging standards. The Marketing Messages marketplace searched for providers that can provide an interactive experience when browsing for specific criteria. The Marketing Messages former website was limiting their growth by not being able to provide this experience. To complement a newly designed website, Marketing Messages also expressed interest in a redesigned company logo. 3 Media Web worked with Marketing Messages to generate a contemporarily designed website with all their requested features, including an up-to-date redesigned company logo. 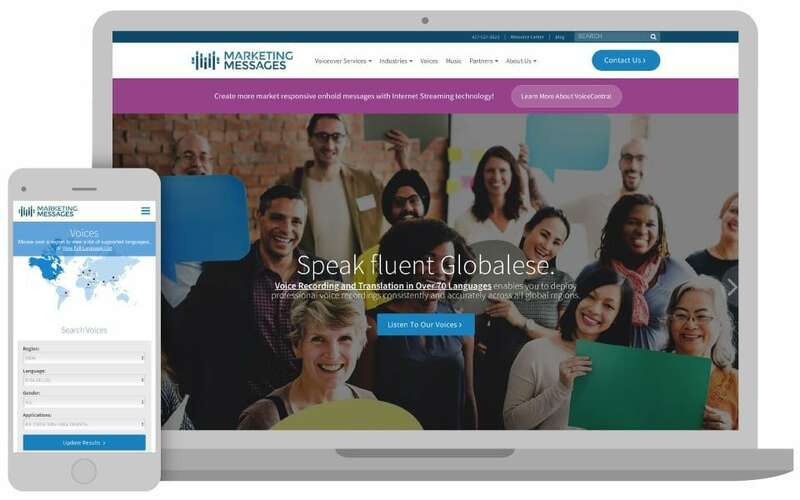 The new Marketing Messages website enables visitors to browse and listen to a range of voice talent in over 70 languages. 3 Media Web created a search bar for potential/current clients to search the different voices Marketing Messages has to offer. We created a database which made it easy to store a wealth of voice and video content.